Russian government has recently asked Apple to give local intelligence agencies the source code of its iOS and Mac OS X. According to what the authorities say, such a step is required to make sure that the company software is not used for government surveillance. Russian Communications Minister Nikolai Nikiforov was the person who met with Peter Engrob Nielsen, Apple's general manager in Russia last week and asked about the handover of the source code. 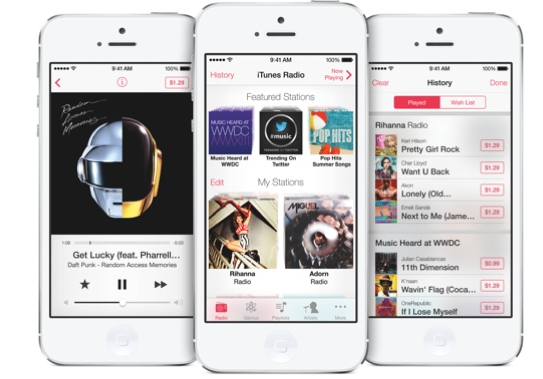 Tagged with app, Apple, Hardware, Intel, iOS, iPhone, Mac, Mac OS X, Nielsen, SD, sed, U.S.
For the first time since iTunes Store launch in 2003, digital music sales have decreased in 2013. Industry analysts say that the reason for such drop in sales is closely connected with streaming music services - Pandora, iTunes Radio and the others. People prefer listening to their favourite tracks and albums online rather than purchasing and downloading them to their devices. According to a research conducted by Nielsen in the United States, over the course of the next 6 months, consumers between the age of 6 to 12 years are interested in buying iOS products form Apple. New Nintendo Wii U took the second place on popularity, but rated behind the iPad. However, iPod Touch, iPhone and iPad Mini entered the top 5 most popular products for this age group. Android and iOS represent over 90% of smartphone market in the U.S. According to Nielsen, during the second quarter of 2012 smartphone use continued to increase in the U.S. where 54.9 mobile subscribers use smartphones as of June of this year. Among the acquirers who bought their smartphone in the last three months 36 percent said they chose an iPhone and 54 percent bought an Android smartphone. According to the latest data from research company Nielsen, Apple’s iOS and Android have both accounted for over 90 percent of U.S. smartphone purchases in last three months. 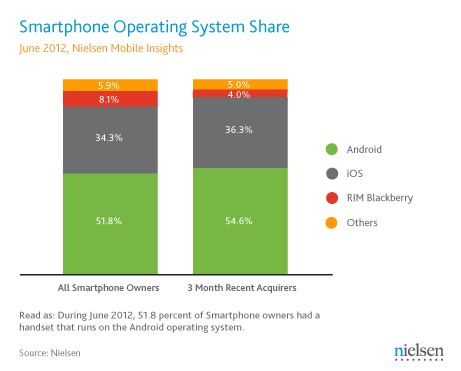 During the same period the closest competitor RIM’s Blackberry was bought only by 5 percent of respondents. 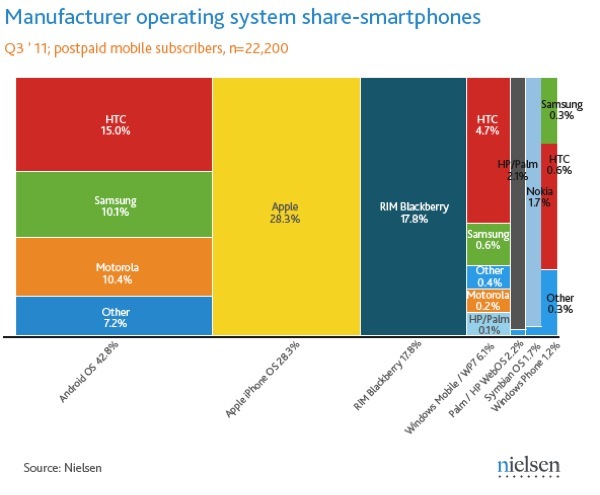 Other operating systems such as WebOS, Symbian, Windows Phone get only 4 percent share combined. Businessweek suggests that in the coming year TV industry will move towards voice-activated TV remotes, because of Apple's plans to enter the TV market in the near future. Many analysts believe that Apple’s TV will have Siri voice recognition system to simplify user interaction with the TV and provide users to control their TVs with voice. 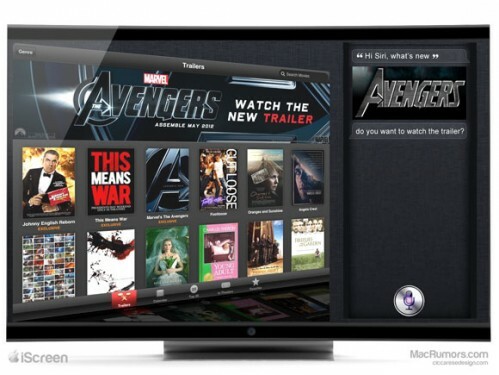 Whether the rumors are true that Apple is planning to release a TV set by 2013, Siri-like voice recognition is headed for the living room. Microsoft (MSFT) is already there, via its Xbox 360 game console, and Comcast (CMCSA), Samsung Electronics (SHCAY), LG, and Sharp are working on voice-enabled features for TV sets, set-top boxes, and related products. Businessweek believes that simple voice command as "Record the next episode of Modern Family" are much needed to improve user experience. Jakob Nielsen of Nielsen Norman Group goes on to say "Anything would be better than what we have now." The remotes for such voice-controlled TV are said to look more like iPhones than traditional remotes, with possibly a single physical button to activate the microphone. Nuance suggests that 5% of TVs could be voice controlled by Christmas 2012. Marketing firm BlueKai compiled the profile of the typical iPad buyer. 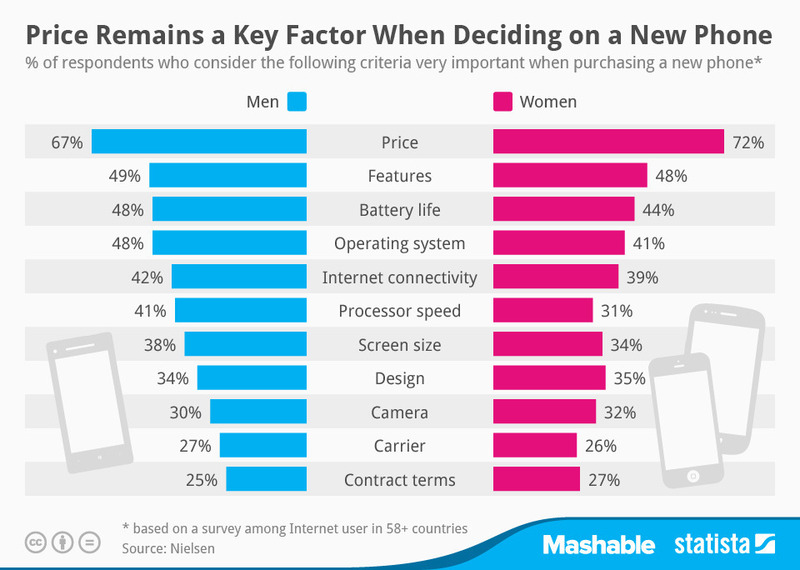 So, a typical iPad owner is male, has pets and buys video games. Scientists or health care workers, international travelers, apartment dwellers and proponents of organic food are also among those people who are highly likely to purchase the iPad. 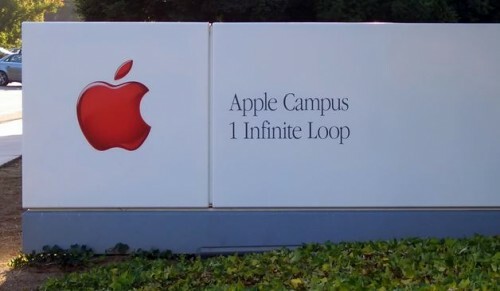 The firm also found that vitamin takers, domestic business travelers, married couples and college graduates are typically owners of the iPad. BlueKai created an infographic (below) to reflect its findings, including information received from other research firms. According to comScore, 45.9 percent of tablet owners belong to households earning $100,00 per year or more, while Nielsen has discovered that 70 percent of all iPad use occurs in front of a TV. 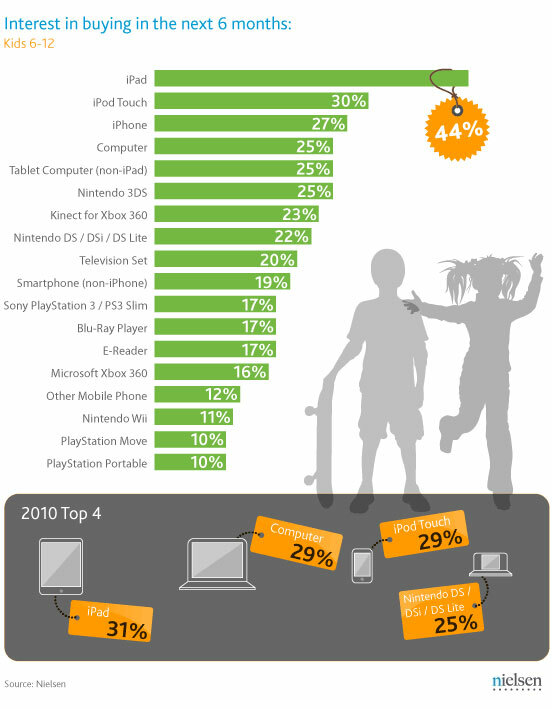 In October research company Nielsen conducted a new survey among 3,000 U.S. children at the age from 6 to 12 ahead of 2011 holiday season, and found out that the iPad is the most-wanted gift for kids, while the iPod touch ranks second and the iPhone comes in third. 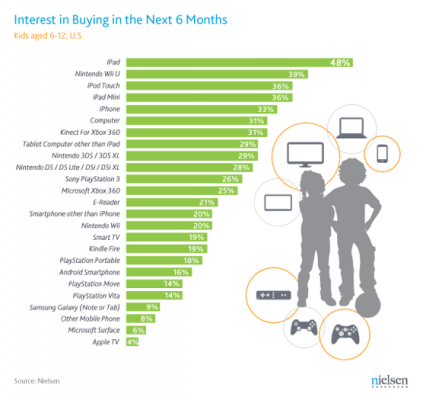 44 percent of kids are interested in getting an iPad, 30 percent want an iPod touch, while 27 percent prefer to get an iPhone. The iPad dominates among teenagers: 24 percent of those polled said they are interested in buying an iPad in the next six months. Apple's iPhone is in the seventh place with 15 percent, while iPod touch is in twelfth with 8 percent. Today research company Nielsen published its survey on mobile users for the third quarter, which confirmed that Android and iOS remain two main player on the smartphone market. Android platform increased its share of the US smartphone market by 4%, from 39% to 43%. 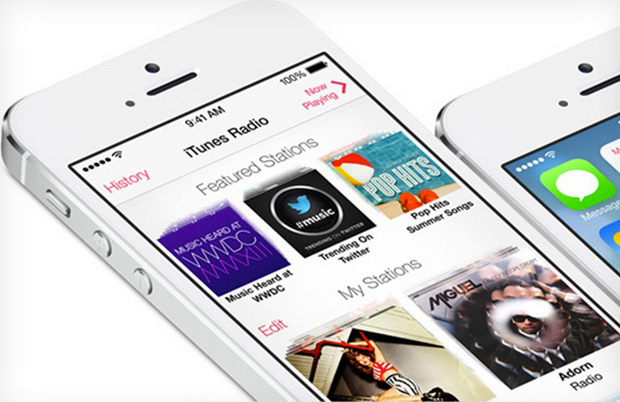 During the same period iOS remained flat with 28% share. Google and Apple, two main parties on the smartphone market, are continuously fighting for consumers especially those who have not yet decided which OS they want to have in their next smartphone. 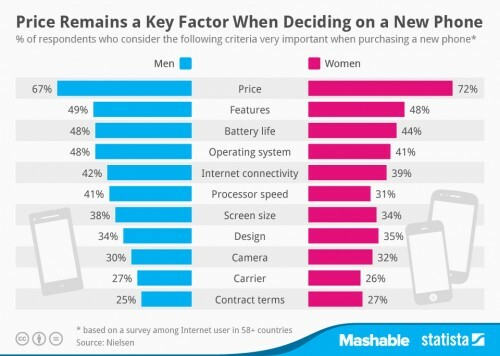 According to Nielsen survey in July 2011, these ‘undecideds’ will be the customers which manufacturers will be hoping to win over. It is interesting that late adopters are least sure among likely smartphone upgraders about their next phone platform. 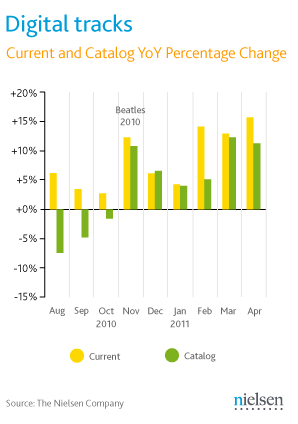 According to Nielsen Soundscan report, US music sales have increased by 1.6% over the course of this year. The report gives the credit for the rise, unsurprisingly, to digital music sales, which in terms of albums was up 16.8% and in terms of individual tracks was up 9.6%. As for physical media, CDs were down by 8.8%, but Vinyl increased by 37%, although they only account for 1.2% of sales. 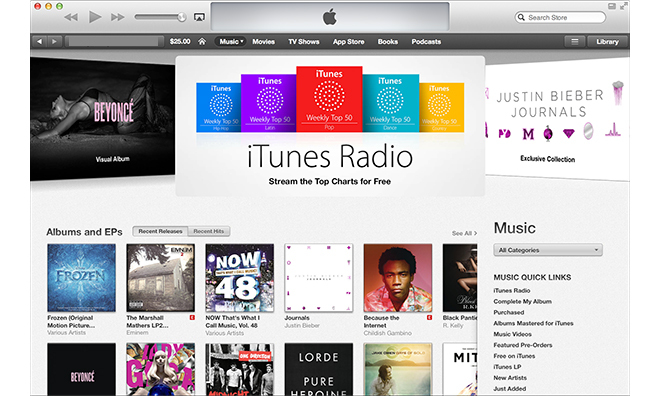 Nielsen interestingly suggests the arrival of the Beatles on iTunes as a key reason, pointing to a dramatic increase starting from when it was released on iTunes. As for the most popular genre’s, Rock had the greatest market share in album sales whilst Pop was the most popular for digital tracks.